In a world where terrorism and mass killings are a reality, emergency response personnel have added a new tool to the arsenal of first aid: stop the bleed. Our Lady of the Lake Regional Medical Center in Baton Rouge has taken on the effort to educate the public about this important tool and is hosting free seminars. 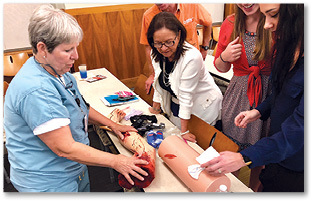 One such seminar was held recently at the Louisiana Department of Health and Hospitals where more than 50 employees learned how to apply tourniquets, apply pressure and pack a wound. Paige Hargrove, executive director for the Louisiana Emergency Response Network (LERN), said that “Stop the Bleed” is a national initiative developed by a federal inter-agency group designed to educate lay people on how to stop the bleed. “The initial work came after Sandy Hook and they found, looking at autopsies and how that event unfolded, that in that situation there were five children that could have survived but died of bleeding out,” said Hargrove. Danielle Martrain, trauma program manager at OLOL, started the training session by explaining the importance of learning to stop the bleed, even beyond tragic events such as mass shootings. Martrain also mentioned how accidents that occur in rural areas could mean longer response time by emergency crews. Martrain explained how a tourniquet can be made from anything including a belt or a shirt. However, if the wound is not in an area where a tourniquet can be applied, such as the abdomen or upper chest, a shirt can also be used to pack a wound, she said. The formula to “stop the bleed” uses the acronym of ABC: alert (call 9-1-1), bleed (find the source), compress. Tourniquets should be applied two inches above the wound, according to Martrain. According to Hargrove, other lessons have come from studying mass tragedies including response time for emergency medical services, which can now go into a situation sooner to administer care to victims. “There’s been a lot of education from first response, even through the police force, knowing what to do from that effort, but it really did spin off after Sandy Hook and so we feel like it’s part of our mission and our duty to help spread the word and provide education,” said Hargrove. “We’re doing this at workplaces and schools. The OLOL Trauma Team is offering free “Stop the Bleed” lessons to schools, businesses, churches and organizations. “The only thing worse than losing a life, is losing a life that could have been prevented,” said Martrain.